The Miele Performance Pack includes 16 AirClean filter bags and a HEPA filter. Each bag has a The AirClean 3D Efficiency GN filter bag has a self-locking, AutoSeal collar that keeps particulates from returning to the air once captured inside the bag. 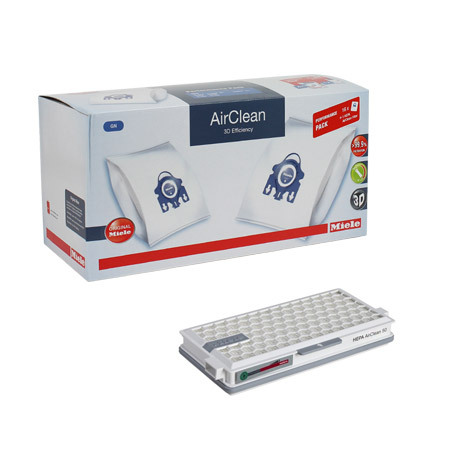 The HEPA AirClean filter combines with the bag to capture 99.999% of particles. The Performance Pack is a great way to insure that you have an adequate supply of bags and filters. And, with a savings of over 20% vs. purchase of separate items, it's a "no-brainer" to purchase the Miele Performance Pack.